Before testing the version, you probably want to verify that Qt is installed. qmake is pretty much always installed whenever you install Qt. Debian and Ubuntu use the qt5-default package which directly depends on qtchooser which includes qmake. Other architectures are likely to use different package names, but you certainly get a similar effect. Many script depend on qmake being installed to check the Qt version which is why in most cases it get installed automatically. echo "error: This script requires Qt to be installed." This should also work under Mac/OS and other Unix systems. You may want to check a different package if you need specific functionality. Note that since Qt5, the name of the package with qmake has changed. Under Debian (.deb), it is qt5-qmake and under RedHat (RPM) it is qmake-qt5. Under MS-Windows, Qt may be installed anywhere and qmake may not be in the PATH variable. However, trying to run qmake is a solution to test whether Qt is accessible. Still, it's not a definitive answer to the problem. Short of something specific to your software, the only way to really know would be to do a search of the entire file system. It will tell you which version of the Qt library it is using. Note: As of Ubuntu 16.04, the pkg-config does not seem to be defined. The macro is compiled at compile time and will not change, whatever happens. If you link against a compatible version, then you get the answer that corresponds to the dynamic version. Note: the use of "%s" and the arguments is important for security reasons. Although it is unlikely that the version would include a % character, if it were, it could have disastruous effects on the printf(). A discrepancy between the compile time and runtime version can be detected by comparing the qVersion() output to the QT_VERSION_STR. If different, you can then decide to do further testing to determine whether things will work. If you need a little handle in order to parse a version, I have a class in my wpkg project that does just that with the Debian type of versions. Qt libraries are generally forward compatible without much problems. Under Linux, it is also mostly backward compatible, although once in a while additional functions are added to the library and if those are used in your software, the dynamic linkage may fail. As more and more people are using cmake instead of other tools to generate their build environment, I thought I should mention this here. Under Linux, the cmake-data package installs a list of Qt files that help you with finding the Qt library, compiling with the Qt library, linking against the Qt library. 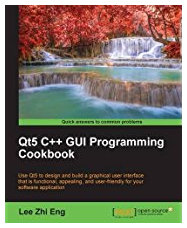 For more about Qt, I suggest you checkout the Qt5 C++ GUI Programming Cookbook book on Amazon. It will definitely help you at work, solving many problems in your development using Qt5. Oh and remember that employers like to get you tools that allow them to reduce their costs and that includes books! Submitted by Alexis Wilke on Tue, 10/23/2018 - 09:17. Great, thank you for the info. I made a few updates around the qmake package name. The first script is still correct, though. Once qmake is installed, you can use it as a sign that Qt is installed. Submitted by Fabian Vogt (not verified) on Tue, 10/23/2018 - 00:42. "qt5-default" is a debian-ism and doesn't exist on Arch/Fedora/openSUSE. Those also don't use "qmake" for Qt 5 but "qmake-qt5".